Capacity (In Litres. ): More than 5 Ltrs. We hold capability in offering the best Milk Can. These are used for the storing and carrying milk. We are involved in offering Vintage Iron Milk Can. The product is strictly checked on well-defined quality norms to ensure its quality. It is awesome designing milk cane use for home decor. We are the leading manufacturer, exporter and supplier of Nautical Decor Items which have been manufactured using high quality raw material including brass, wood and Steel. Based on the skills of our adept professionals and trained workers, we are offering an exclusive range of Decorative Iron Barrel. The provided iron barrel is acclaimed for its antique design in the market. Used iron barrels, refurbished iron barrels in quantity are avaialable. We have marked a remarkable position in the market by offering the best quality array of Anodized Milk Can. This Aluminium Milk cane is vailable in two sizes. It can be made availble with and without lid. Made up of Aluminium Sheet in Matt/Polish finish. Plastic Milk cans are avilable in 3.5 Ltr to 15 Ltr sizes made from Virgin Material. 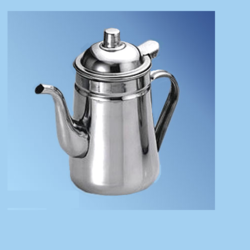 We provide Milk Can to our clients in various specification and sizes and in different material.